Take a direct flight to Xian, the capital of 12 dynasties in Chinese history and starting point for the great trade caravans of the ancient Silk Road. The importance and prosperity of this ancient capital left behind a wealth of valuable historical sites and fabulous archaeological discoveries. The day's highlight will be a visit to the amazing Terracotta Warriors - a world famous archaeological site. Next you will visit the Huaqing Hot Spring, once the favourite bathroom for the Tang Dynasty Concubine Yang Kui Fe. Onward to the National Museum of Shaanxi History. Enjoy a dumpling banquet. Fly to Dunhuang, meaning "Blazing Beacon", was the centre of cultural and economic exchange between the East and the West. Leading institutes of the world regard the Dunhuang collection as an important source of studying Chinese culture, with a stream called "Dunhuangology". Visits will be made to the County Museum, with exhibits from Mogao Caves and sacrificial objects from the Han to Tang Dynasties; and the Yangguan Pass, south-west of Dunhuang with eroded Han Dynasty beacon towers. Spend the morning at the world-renowned Mogao Caves - the largest and richest ancient art treasure-trove in the world. It was inscribed as a "World Cultural Heritage" site by the UNESCO in 1987. 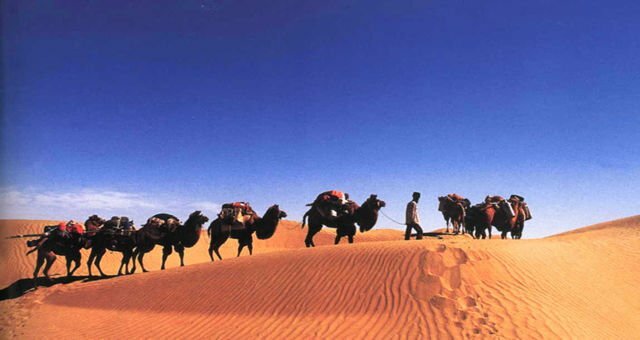 Try sand surfing or camel riding around the Mingsha Sand Dunes and mysterious Crescent Moon Lake. Transfer to the Station for an overnight train to Turpan. Transfer to hotel for breakfast and a rest. After lunch, visit the Emin Minaret, a typical Uygur architecture; the Karez - an amazing irrigation system which made Turpan a rich oasis; and the Ancient City of Jiaohe, a mysterious historical site. Be guest of a Uygur family and savour specialties like milk tea, nan, shish kebabs and poluo rice etc. Return to the hotel for Uygur dance performance. Coach drive past the Flaming Mountain, made famous by the story of the Monkey King; take a donkey cart ride around the Ancient City of Gaochang which contains traces of Nestorian, Christian, Persian and Manichean influences; and the Bezeklik Thousand Buddha Caves. Travel to Urumqi, the capital of the Xinjiang Uygur Autonomous Region. Enjoy souvenirs-shopping at the International Grand Bazaar. Cruise around the Heavenly Lake which is surrounded by alpine meadows and rugged snow-capped mountains densely covered in fir, pine and cypress. After lunch, visit the Xinjiang Regional Museum with exhibits on archaeological treasures from the Silk Road including 3000-year-old mummies. Onward to the carpet factory. Take a flight to Xian to connect a flight back to Hong Kong.